In 2014, Mary Caley, a retired JCPenney manager living in a condo in Laguna Hills, California, turned to her husband, George, with a proposal. Mary and George were addicted to Tiny House Nation, the reality TV show in which mediagenic people downsize, theatrically, into 200-square-foot cottages. What if they were to rid themselves of the burden of decades of possessions, Mary suggested, and move into a tiny house? At first, George resisted. The couple had three sons and three granddaughters, and he liked having a home large enough for the family to gather in. But Mary was dying of breast cancer, and she was the love of his life. That winter, they decided to look for tiny houses in Colorado, where Mary could buy pot for pain relief. Mary’s sister, who with her husband had been roped into the plan, went along. One afternoon they all followed a scenic road to the mountain village of Woodland Park and came across a nine-acre lot on a wooded hillside with a few cute little cottages set at the base. The land was owned by a pair of real estate developers who aspired to turn it into a tiny-house village but hadn’t found any takers. One of them, Pete LaBarre, drove them up the hill, to where two lots sat side by side with views of Pikes Peak in the distance. The following spring, the couples leased the two lots from LaBarre and his business partner, Matt Fredell, bought matching 399-square-footers for just over $70,000 apiece, and installed a white picket fence around their shared yard. The houses were so small and close together that one sister could peer into the other’s window and see what was on television. LaBarre and Fredell had paid $660,000 for the rutted, derelict hillside two years earlier, in 2013. The land had previously been occupied by an old motel and RV park for the transient and indigent; it was notorious around town because, in 2001, a group of escaped prisoners had been discovered hiding there, disguising themselves as missionaries by blasting Christian music. The land went into foreclosure in 2009, then sat unused for years, sliding into disrepair. After they bought it, LaBarre and Fredell cleaned it up, divided it into vacant RV lots, and renamed it Peak View Park, after Pikes Peak. No one took much interest. That’s when LaBarre and Fredell, feeling like they needed a gimmick, decided to rebrand the place as a neighborhood of tiny houses. They ordered three models from a builder in Texas, dropped them by the roadside, and waited for something to happen. A couple of months later, the Caleys drove through. Mary’s and her sister’s houses were undeniably enchanting, with their gingerbread dimensions and sylvan surroundings, and LaBarre started bringing reporters and window-shoppers around for visits. When he and Fredell attended the first annual Tiny House Jamboree, held in Colorado Springs, they noticed that some of the tiny-house models on display—minuscule 100- and 200-footers—were selling for close to $100,000. That evening, LaBarre and Fredell prepared flyers advertising a sale for far less than that, with a photo of a resident’s porch and its view of the mountains. By the end of that year, they had sold two additional tiny houses, to people they’d met at the Jamboree. The following year, they added thirteen more homes; there are now more than fifty. Modest homes have existed for as long as people have sought shelter, but the tiny house—typically defined as a dwelling of 399 square feet or less, often built on a trailer, that functions as a miniature version of a regular house—is supposed to represent a deliberate design choice. The version of tiny living that is glamorized on TV and that appears in curated Instagram accounts features images of young, yogic, flannel-wearing couples lazing about in delicious little spaces. The lifestyle encompasses camper vans, tree houses, sailboats, RVs, and yurts, but the tiny house is its original, and most appealing, form. If you live in a trailer or a cramped apartment, you’re assumed to be indigent; if you choose a tiny house, which costs about the same amount for less space, you’re making an aesthetic, even moral, statement about living well in an age of excess. And yet the most surprising aspect of the tiny-house phenomenon might be that, while the lifestyle has never been more visible, real-life tiny-house dwellers are hard to find. Fewer than ten thousand of the homes are estimated to exist nationwide. The impracticalities of tiny living—shoebox-sized sinks, closetless rooms—can be daunting, but it’s not only that. There are also legal obstacles. In most states, houses built on a foundation must be at least 400 square feet. To get around that, builders have taken to putting tiny houses on wheels and building them to the less restrictive codes that apply to RVs. But many states and cities bar RVs from being parked in one place year-round. Also, when you buy a tiny house, the house is all you get; you have to either buy the land to put it on, use someone else’s for free, or find a landlord willing to lease land to you. Around the time of LaBarre and Fredell’s entrepreneurial gambit, the discrepancy between the realities of tiny living and its on-screen representations had generated a great deal of confusion. Inspired by HGTV and Pinterest, people would set out to buy tiny houses, only to learn that tiny living, in the real world, is supremely hard. LaBarre and Fredell weren’t aware of this state of affairs, but, as it happened, they were poised to benefit from it. Their land had been used as a full-time RV park for years, long before a county ordinance banned it, and LaBarre argued that it should be grandfathered in for that use, including for tiny houses, and won. In building their tiny-living community, they might not have known what they were doing, but they happened to be among the only ones doing it. Shafer didn’t invent small houses; he invented a sales pitch for them. After he built his house, he founded what’s recognized as the first tiny-house company. Tumbleweed Tiny House Company sold plans that people could use to build their own little houses. In 2007, Shafer and one of his houses appeared on The Oprah Winfrey Show. In one scene, he stood in a narrow shower stall and cheerfully hoisted a composting toilet next to his head to demonstrate how little, really, need be asked of a bathroom. Next, viewers toured a lofted bedroom with a three-and-a-half-foot ceiling, and a kitchen whose sink delivered water from an upside-down jug. Oprah’s voice-over came on—“For Jay, living small is mostly about personal happiness”—and then the camera cut to Shafer again, hunched over the sink with a toothbrush in his mouth. After the Oprah episode, interest in tiny-house culture took off. Shafer drove along the West Coast in a pickup, towing a tiny house and stopping to give workshops. Design magazines started featuring the houses. Many offered space-saving tricks that were clever, if impractical for quotidian use: a dining table that transformed into a bed, a bed that could be stowed under the kitchen floor, a side hatch that opened up into a barbecue grill. An article about a young couple moving into a 300-square-foot house made its way to Jon Feld, the senior vice president of original programming and production for HGTV and the FYI Network. “I said, ‘What is this? Like a cabin?’” he recalled. He and his people did some research. “We all quickly got educated that it’s not a cabin at all, that this is a huge movement and we needed to jump on board.” In 2014, the FYI Network launched Tiny House Nation, about people searching for tiny dream houses. (In a typical episode, the buyer describes a utopian vision of tininess, then spends the rest of the episode stressing that the available options are too cramped.) Since then, Feld has also developed Love Yurts, Tiny House Arrest, Tiny House Hunters, Tiny House Builders, Tiny Paradise, and Tiny Luxury, among other shows. The programs don’t get into details like getting loans, finding land, or hooking up utilities, which, as far as problems go, are more vexing but less fun to watch than downsizing a shoe collection. However, most tiny-house residents are not particularly well-off. While the poorest people tend not to buy tiny houses—purchasing any home requires capital—tiny living is popular among the widening group of working-class Americans who might have owned a traditional home a generation ago but have found themselves with bank statements or credit histories that have made that choice impracticable. Many are older, single women. The median price of a home in the US is $220,000, which most people finance with a mortgage. Tiny homes usually sell for $40,000 to $90,000 without land, and buyers typically pay cash or finance them with a property loan. After he pioneered the tiny-living trend, Jay Shafer married, had two sons, and moved into a conventional house, keeping a tiny one in the backyard as a showroom and office space. Since then, he’s fallen on hard times. He left Tumbleweed after a dispute with his business partner, went through an uncongenial divorce, and finally became homeless. 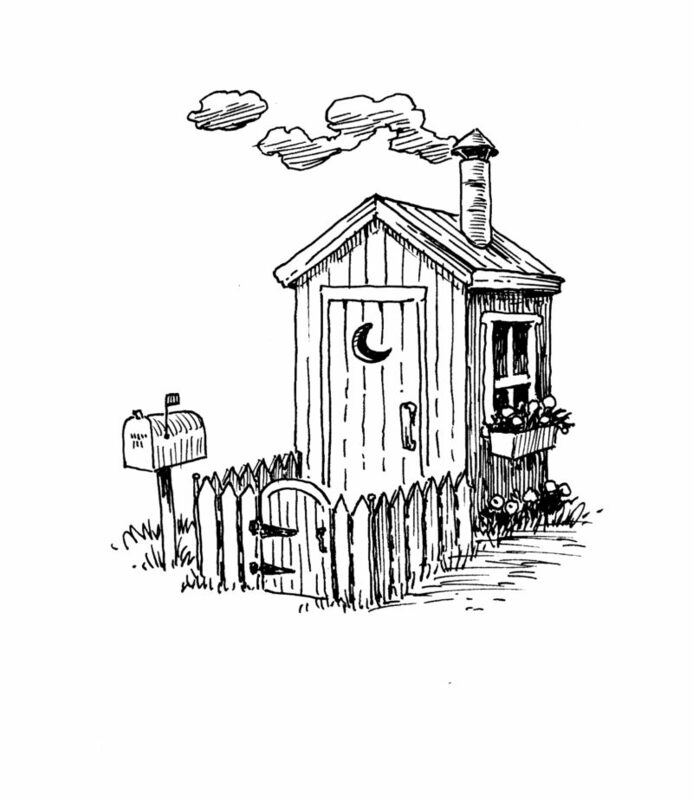 “I’m now living in a pigpen,” he told me—a shed, shared with pigs, in a friend’s salvage yard. Lately, though, he’s been designing a new home, and this time he’s embracing the affordable-housing angle: “I’m not going to let myself live on the streets ever again, so I designed a one-thousand-dollar house.” That’s the cost of the shell; the rest, including appliances, will add on thousands more. To turn a profit, Shafer figures he’ll sell the house for a bit under $10,000. It measures 50 square feet. One warm afternoon last winter, LaBarre drove me up a steep, ribbon-like road shaded by Ponderosa pines. The houses at Peak View Park were planted a couple of yards apart, on a slant, like cars in an angled parking lot. They were diverse in style—a log cabin, a refurbished shipping container, Craftsman-style bungalows—but unified by an appealing minimalism. Several of them looked down through the pines onto the four-lane state road connecting Colorado Springs to the ski resorts. On the far side of the road was a Walmart; beyond that rose Pikes Peak. To lease a piece of this land, most residents paid $500 to $600 a month. Utilities were included; the house itself was not. The people of Peak View did not, on the whole, resemble the young aesthetes who appear on HGTV. The hundred-plus residents included a school bus driver, a baker, retirees, and children. Courtney Cunard, a forty-year-old aesthetician, had been raised in trailer parks around Los Angeles by a single mother who died when she was thirteen; she had promised herself she would own a home one day, but her mortgage applications kept getting rejected. She had been living on friends’ couches and in an aunt’s garage before discovering Peak View’s alternative route to homeownership. Much of her furniture, like a wine rack affixed to the wall, had been custom-built by her boyfriend to fit in her new house; her desk, in a lofted office, stood a foot and a half off the floor. Down the street from Cunard, Anna Lawler, a retired office manager, lived with her fifteen-year-old granddaughter, Malissa; Anna had moved them to Pike View from Fontana, California, to escape the influence of drugs and gangs. A regular mattress wouldn’t fit up the stairs to Malissa’s room, so they bought one of those mattresses from the Internet that come rolled up in a box, then chucked it up from the living room. Mary Caley, who had been a sort of matron figure for the community, died two years ago. One morning, LaBarre took me to visit George. He was a stout, bespectacled man with a rascally sense of humor—“our little Ewok,” one of the neighbors affectionately called him. He answered the door with a little dog leaping at his heels and a breathing tube dangling from his nostrils; he’d just gotten out of the hospital after a bout of pneumonia, and he was still pale and short of breath. We sat in his living room, which was, of course, small, but nonetheless accommodated a flat-screen TV, a dog bed, and a pair of recliners. Every surface was covered with clutter: hand lotion, medicine, remote controls, playing cards, ziplock bags full of odds and ends. George’s friends the Bohatches were part of the First Street group. The family of four lived in a 399-square-foot cabin-style house. There was Julie, a stay-at-home mother and former Montessori teacher; her husband, Mike, a search engine optimization specialist; Brynn, their fifteen-year-old daughter; and Nova, their three-year-old granddaughter, whom they had adopted from an older daughter. One night four years ago, Julie and Mike had been watching tiny-living TV in their rented house in Michigan, and Julie had joked that they should buy a little house of their own. They had been thinking of moving back to Colorado, Brynn’s birthplace and the setting of some of their happiest times. A couple of days later, Mike said, “You know, there’s a tiny-home park in Woodland Park.” Julie balked at first. She would have to give up her king-size bed. Plus, she and Mike were both pushing fifty, with a complicated parenting situation; most of the families they’d seen on TV were younger and smaller. Mike was serious, though—their last homeowning experience had ended in disaster. During the housing bust, they’d drained their retirement savings to try to hold on to a 3,000-square-foot house in Colorado Springs, but it had still been foreclosed. “We can throw down another three hundred thousand dollars on a home, or we could do it for under one hundred thousand dollars,” he told Julie. “We wouldn’t have to be slaves to the house, work and work and work, like we did before, because we’ve got to worry about our mortgage payment for the next thirty years.” Julie had been dreaming of buying a log cabin. She started researching tinies with a woodsy look. In September of 2015, Julie and Mike toured Peak View. It wasn’t much to look at—a big, sloped patch of reddish-brown dirt, with only a couple of tiny houses, including the Caleys’—but LaBarre and Fredell described their vision of a neighborhood filled with homes and attractive landscaping. Julie ordered a house with a log exterior from a builder in Alabama for $87,000 plus $8,000 in shipping. To prepare for the move, she taped off a 100-square-foot space in the living room of their Michigan house and made everyone discard their belongings until their remaining possessions, along with their own four bodies, fit inside. The following June, the family packed up and moved. Julie’s mom, Sandra, joined them at Peak View last year. She had lived for years in San Jose in a mobile-home community for people aged fifty-five and older. She owned a double-wide trailer, but her rent on the land underneath kept rising—it’d reached $1,000 a month—and the area was getting rougher; a neighbor she’d often greeted had been killed. At Julie’s urging, she sold her trailer and paid $74,000 in cash for a house on a lot up the hill. At the time I visited, she was couchsurfing around First Street while her utilities and insulation were being installed. Julie had warned Sandra to declutter. She’d suggested limiting her belongings to fifteen plastic bins; instead, as far as Julie could tell, Sandra had shown up with fifteen hundred of them. “You just wait till you start getting things out of storage,” Julie told her mother one afternoon, as we sat together in her living room. “I’m just going to stand there and go like this,” she said, shaking her head in exaggerated disappointment. Nationwide, the homeownership rate is at its lowest point since 1965, for reasons that boil down mostly to finances. Housing is too expensive; credit standards are stricter than they’ve been in years; millennials have too much student debt to save toward a down payment. And yet, according to Fannie Mae, 82 percent of renters report that they’d like to buy a home someday. Homeownership remains central to our understanding of what it means to be successful. Many of the tiny-house dwellers I met had been renting before their move, and those who had owned homes had downsized at least in part for financial reasons. Among the available options, they’d chosen tiny houses, because where trailers, motor homes, and apartments suggest financial hardship, tiny houses are associated with positive traits: freedom, iconoclasm, sustainability. “Mary used to get upset when I called it a trailer,” George said. “I told her, ‘If we do get a tornado, everything’s going to be gone except the frame.’ She just didn’t like the idea of it being a trailer. She said, ‘It’s a tiny home.’” The tiny house has managed to become a form of affordable housing that doubles as a status symbol. It’s one version of the American dream that feels attainable. Because of this, tiny houses might offer one solution to the country’s housing crisis. Affordable-housing advocates in several cities have been building tiny-house villages for the homeless. After Denver banned “urban camping”—sleeping outside with tarps, sleeping bags, or tents—advocates for the homeless built a community of tiny homes that housed fifteen people. Cole Chandler, who helped lead the effort, told me that people living on the streets often asked him why the government criminalized them for being homeless but also prevented them from constructing makeshift shelters for themselves in a city short on affordable housing. “Obviously, there are all kinds of answers to that: zoning, building codes, health, and safety,” he told me. “But one of the biggest reasons is that a modern American city, especially a growing one, is obsessed with property values.” In regulating land use, cities seem to prioritize the generation of wealth over the social good. Indigent people, whether they’re sleeping in parks, tents, or housing projects, are not good for one’s Zillow Zestimate. But the faddishness of tiny houses allowed Chandler and his co-organizers to put a positive spin on their project and, not incidentally, lower their costs. Builders donated materials; Denverites volunteered their time to put the homes together; a local nonprofit allowed the use of its land at no cost. Besides addressing homelessness, some developers hope that affordable tiny-house neighborhoods like Peak View can offer an upscale take on the much-maligned trailer park. They believe tiny houses could be less prone to not-in-my-backyard-ism than other flavors of affordable housing. While poverty has traditionally been concentrated in big cities and rural areas, it has fanned out to smaller cities and suburbs, where big apartment blocks might not be a feasible, or desirable, solution to the housing crunch; perhaps tiny houses could make sense in some of those places. Communities like Peak View have already appeared in Florida, Texas, and California. In 2014, Spur, Texas, population 1,318, declared itself America’s first tiny-house-friendly town, offering to sell little plots of land for $500 each. New York City mayor Bill de Blasio even mentioned tiny houses as an option in a housing plan published in 2017. George, Julie, and Sandra, like the people they’d seen on TV, felt they’d made a liberating choice. Renting an apartment was a nonstarter for all of them—they valued having a place of their own. Buying tiny homes had freed them from the financial pressures of owning a larger home, as well as from the stigma and perceived danger of living in a trailer park. Julie wanted to be a full-time mother; Sandra appreciated taking weekend trips to the mountains without stressing about the price of gas. By taking matters into their own hands they felt capable, even noble. The First Streeters weren’t holding out for a world in which people were paid well enough, and housing was affordable enough, that they could live in a place larger than 399 square feet without worrying about their future. One afternoon, Sandra and I drove up the hill to check out the progress on her house; the setup was taking longer than she’d expected, and she worried that it would be New Year’s before she could move in. She was anxious and annoyed. We found the handyman outside the house, getting ready to leave. He had still not installed insulation, but he reassured her that she could move in anyhow. “You’re not going to freeze to death or nothing,” he promised. Leasing someone else’s land for your tiny house, as people do at Pike View, means depending on the landlords for at least part of your maintenance—LaBarre and Fredell’s rule is that, after the initial setup, they’re responsible from the ground down, and tenants are responsible from the ground up—and knowing that your monthly rent, unlike a fixed-rate mortgage, can and likely will rise over time. Landlords aside, there are other hassles. Tiny houses have none of the benefits of real estate investments. Banks don’t sell mortgages for tiny houses, so buyers have to take out property loans at a much higher interest rate. And without land, tiny houses have no property value, so as an investment they resemble cars more than houses: they depreciate. In October, LaBarre told me that he and Fredell, pleased with their success in Peak View, are planning to break ground on another site nearby, where they will build houses themselves instead of selling them on behalf of outside builders. The homes will be 500 square feet and set on foundations; they plan to market them as “small houses” and sell them for $115,000, including land. Peak View has seen some turnover—Anna had a health scare and returned with her granddaughter to California to be closer to relatives, and Mary’s sister moved to Florida—but George, Julie, Sandra, and their friends remain. Jay Shafer, the tiny-house forefather, moved into his fifty-square-footer, which ended up costing him $5,000. “It’s much cleaner than the pigpen,” he told me in an email. Meanwhile, competition continues to grow in the market he helped pioneer. Two years ago, Clayton and Cavco, two of the biggest producers of manufactured homes, launched tiny-house lines. The Clayton Saltbox, which at 452 square feet stretches the definition of a tiny house, sells for $130,000 and features quartz countertops and nine-and-a-half-foot ceilings. As for Tumbleweed, the company founded by Jay Shafer, an RV dealer recently bought a majority stake in it. Still, even the highest-profile builders acknowledge that it’s not clear when, or even if, the tiny house will become a mainstream form of affordable housing. Some of the most lucrative markets for tiny houses are resorts that rent them out to tourists, and upper-middle-class homeowners who style tiny houses as guest cottages or second homes. Living tiny is the easiest sell, it seems, for people who want a temporary vacation from living large. He didn’t appear fazed; tiny houses, it seems, malfunction fairly often. Because they are so often built on wheels, and with an uninsulated undercarriage, the pipes are susceptible to freezing unless the houses are surrounded with skirting. (The homes at Peak View are generally skirted.) My husband and I ended up in one of the resort’s basic models, a little pine-walled dwelling with an anemic heater, a single hot plate, a mini-fridge, and such limited storage space that the dishes were kept under the sink next to the trash can. The only way to get from one side of the living room to the other was to crawl across a bed; we supposed we could fold the bed up against the wall, but then there’d be no place to sit. That evening, my husband stood on the ladder leading to the second, lofted bed—there wasn’t room to stand anywhere else—and said, in a small, flat voice, “This is our vacation.” We hadn’t accounted for how vexing a house this size could be on a purely athletic level: all this ladder-mounting and ducking and pretzeling of one’s limbs just to get through a couple of hours without sprains. The next morning, though, WeeCasa upgraded us to a more spacious unit, complete with a functional heater, a little couch, and a more reasonable kitchen. We sat at the dining counter with takeout burritos; we squeezed onto the couch, shoulder to shoulder, with our magazines; we settled into bed with Better Call Saul. It all felt quite charming and snug. But then, there was much we were able to avoid, too, during a two-night stay: cooking, washing clothes, chasing our toddler. “See, we’d have no problem living like this,” my husband said in the morning, and then, because we could, we went home.